In the duration of 6 weeks I made it to two countries --Philippines and Canada! In an earlier post I told you about my Canada journey and now I'm sharing my Philippines one! 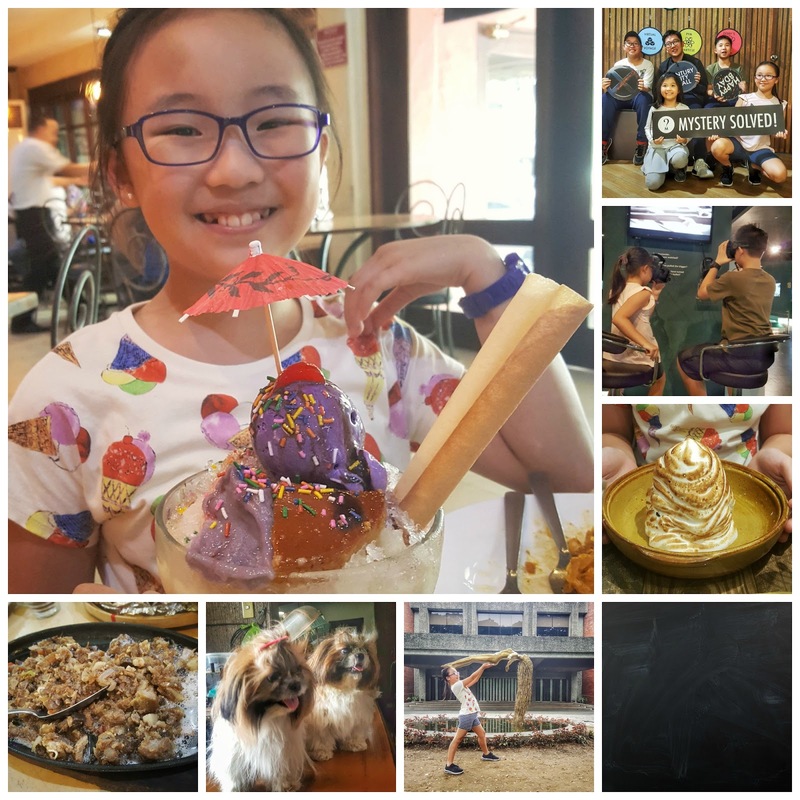 I stayed in Philippines for 3 days and I went to my mom's university, spent time with my grandparents, went to a museum, did an escape room and had a lot of halo-halo (a special dessert with shaved ice and lots of other ingredients)! When we went to my moms university, we met up with some of my mom's friends! At my mom's university there were two statues: The Oblation (A naked man) and Uplift (Floating woman, bottom right in collage). They were really cool! We also went to UP Town Center, where I ate an El Fuego (one above the black) for dinner. It had ice cream and cake inside the marshmallow! We also met with my mom's cousin and his children. Together we went to an escape room with a theme based on mutants! We were able to get out, fortunately (top right photo in collage)! After that we got bubble tea. During the stay we also went to the Ayala Museum. In the museum, it tells you all about the Philippines' history. There was also a virtual reality experience! Dogs are so cute! I got to spend some time with Princess and Prince (bottom row, left side of statue)! Princess and Prince/Taba (Taba means fat and that is all he responds to) are the names of the dogs that my great-aunt has. They are so cute! 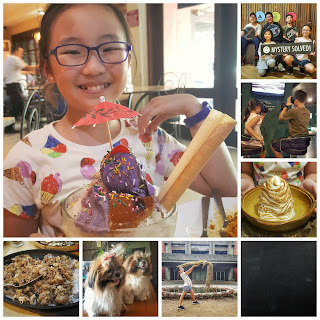 Although all these things were fun, the highlight was eating sisig! Sisig is parts of a pig's head that have been chopped up and cooked together with shallots, onions, garlic! It was actually really good! What is the most extravagant thing that you've ate? SO brave and adventurous of you to try new food!